Plastic extrusion process converts plastic materials as plastic chips or pellets from solid to liquid form and reconstitute them in final shape of finished product. Extrusion Machinery is used for gravity fed and dried in a hopper into the barrel of the extruder before going to the feed screw. Additives are mixed with resin prior to arriving at the hopper. The polymer resin is heated from the extrusion screw by heating elements and shear heating. The screw forces the resin through a die to form a desired shape from resin. The extrudate is pulled through the die or water tank to cool and solidify. A multitude of polymers are used in the production of plastic tubing, pipes, rods, rails, seals and films. During Plastic extrusion process the material transform from solid to liquid and back again to solid form in defined shape without losing the distinctive properties with minimum scrap and degradation, have made plastic extrusion method more popular, which even reduce the recycling plastic wastage. Our firm has a very modern and sprawling infrastructure which has all the latest and sophisticated facilities to manufacture High quality pet strap plant. These are provided with Helical Gear Box with Inbuilt Thrust Bearing for better performance. Our veteran engineers only use qualitative components and contemporary technology while manufacturing this machine. Besides, we assure our clients that this machine is quality tested against predefined quality parameters, in order to meet international standards. We, Ocean Extrusions Pvt. Ltd., established in the year 2006, are among the prominent manufacturers, exporters and suppliers of supreme quality of Plastic Extrusion Machinery. The product range offered by us is inclusive of Extrusion Machinery & Reprocessing Machinery. These machines are precisely engineered in compliance with the industry set norms and regulations by using cutting-edge machinery. Offered by us at affordable prices, these machines are easy to operate and require minimum maintenance. Due to their optimum performance, longer functional life, energy efficient design and sturdy construction, these machines are highly demanded in the market. The offered machinery range is available with us in user-defined specifications. Ocean Extrusions Pvt. Ltd. have been able to cater the needs of our valuable customers in an effective manner, with the aid of sophisticated machinery and a skilled workforce. By using quality assurance procedures and latest tools, our team of quality controllers ensures that the premium quality of this machinery is maintained at all times. We have been able to cater a huge clientele across the global market. 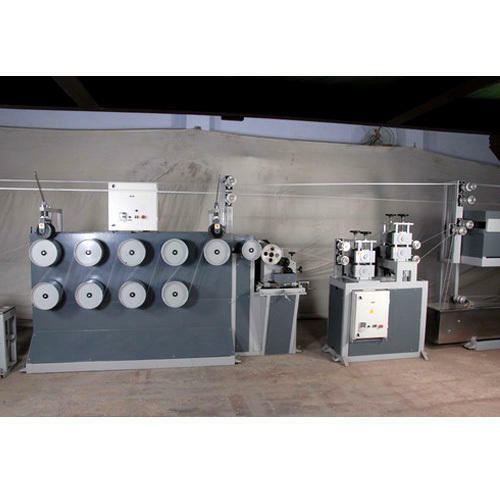 Tandem Lamination Plant for coating Circular Woven Fabrics, for producing multi layer laminates up to 5 layers along with the various substrates like Paper, Aluminum Foil, Polyester film etc. Plastic processing machinery manufacturer, plastic extrusion plant, thermoplastic extrusion plant, monolayer film plant, air bubble sheet plant, polymer pencil plant, net making machine, blown film plant with rotating die, multilayer film plant, box strapping plant, lamination plant, woven sakes tape plant, rigid PVC pipe plant, rigid HDPE pipe plant, Recycling Plant, wire coating plant, cable coating plant, profile plant, blown film plant, PP straw, LD shrink film plant, PVC shrink film plant, HM monolayer film plant, HM multilayer film plant, HDPE monolayer film plant, LDPE monolayer film plant, LD monolayer film plant, HDPE multilayer film plant, LDPE multilayer film plant, LD multilayer film plant, PP TQ film plant, PP box strapping plant, HDPE box strapping plant, PET box strapping plant, PP sutli plant with 'T' Die, LD refill plant, PVC refill plant, multilayer blown film plant, plastic machinery manufacturers, plastic machinery exporters, manufacturers, exporters, manufactures, exports, Australia, Canada, China, Germany, Lebanon, Malaysia, Singapore, South Africa, UK. Ocean Extrusions is manufacturer & exporter of plastic extrusion machinery including multilayer blown film plant, mono layer blown film plant, air bubble sheet plant, extrusion coating lamination plant, PP-TQ blown film plant, PP box strapping line, sutli plant and plastic reprocessing plant from Ocean Extrusions Pvt. Ltd., Ahmedabad, India. We are Exporting our Machine in Different Countries like Indonesia, Brazil, Nigeria, Bangladesh, Russia, Mexico, Japan, Ethiopia, Philippines, Viet Nam, Egypt, Iran, Germany, Turkey, Thailand, U.K., France, Italy, Tanzania, South Africa, Myanmar, South Korea, Colombia, Kenya, Spain, Argentina, Sudan, Uganda, Algeria, Iraq, Poland, Canada, Morocco, Afghanistan, Saudi Arabia, Peru, Malaysia, Uzbekistan, Nepal, Ghana, North Korea, Australia, Sri Lanka, Syria, Zambia, Zimbabwe, Senegal, South Sudan, Tunisia, Belgium, Greece, Portugal, Belarus, United Arab Emirates, Serbia, Switzerland, Honduras, Jordan, Lebanon, Singapore, Denmark, Liberia, New Zealand, Kuwait, Georgia, Albania, Qatar, Mauritius, Fiji, Cyprus, Bhutan, Maldives, Etc.